In My Daily Choice/Hempworx, your Power Leg is the one built mostly by your upline or Sponsor. In a Binary Matrix you have a Power Leg and a Pay Leg. When you enroll under a leader, your Power Leg is built for you. That is because in a Binary Matrix, where two people get two people that get two people, etcetera, there can only be two people on any given level. In my case as well as in the case of any real leader, both of my legs are thousands of levels deep. This happens because I am constantly sponsoring people and since there is only room for two people on any level, the over flow must go downline under someone else. So if you are enrolled on my team, regardless of which of my legs you came in on, you will have several new people join your downline every day as new Pre-enrollees. You only need 300 BV on your Power Leg to qualify for all of the bonuses, so most people set their rotator to enroll everyone on their Pay Leg, once they have met the minimum requirements on the Power Leg. This allows them or you to concentrate on only one leg as the other leg is built for you. This is why you want to enroll under someone that is active. Otherwise, you would have to build both legs. People ask me how many people it actually takes to become successful. The truth is that it only takes a very small amount of people that are actually active. You may have to enroll a hundred times this many in order to find your key people and that is why you never stop enrolling new people. It has been said that if you have only one leader on your team that you will live comfortably. If you have two or more leaders on your team, you are set for life. If you sit down with a pencil and start with one person and double it to two people and double that to 4 people and then 8 and 16 and 32. 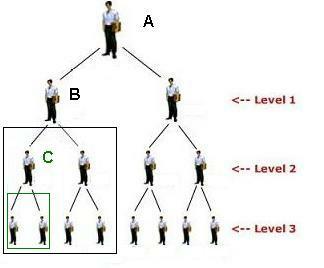 Keep in mind that you personally only recruited two new people in this example and it grew to 5 levels deep. The next five levels are much more impressive. Sixty four people each get two and that makes 128 and then 256, and 512, and finally 1024. That is how many people there are on your tenth level if you get only two people that get only two people, etc. Imagine what happens when people bring in more than two people each. Sometimes people have trouble sponsoring only two people. Generally, that is because they don’t know how or do not have a system. You have to have a system. You have to have something that brings a constant flow of people to your Free Tour. You can learn how to attract people through social media and many times this does not cost any money. There are many books and articles on this subject and you would do well to read them. There are many forms of paid advertising and it can be a tremendous help to use apid ads in the beginning while your blog or Youtube channel kicks in with a significant amount of traffic for free. Blogs and videos are perhaps the very best source of free leads. But it takes time. You should spend the time necessary to create quality content for your blog and videos. Google and other search engines will happily send you traffic once they have determined that you are a credible source. All search engines want to supply the very best answers to your questions. That is why they send links to sites with a domain authority. They generally will not send you to a site that is new and only has a dozen articles. That is why you continually write new content so that your Page Authority and Domain Authority will increase. If you want to lock in your position in my downline and are not already on my team, please take this Free Tour now.